Thoroughly enjoyed the course on Wednesday – even with the film crew! 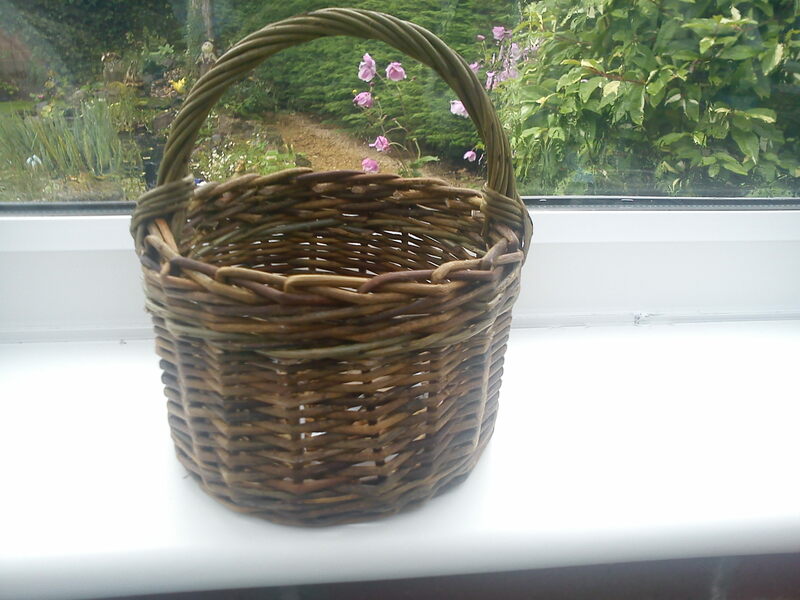 Managed to make a beautiful basket and even spent a couple of hours on Saturday afternoon doing some homework !! 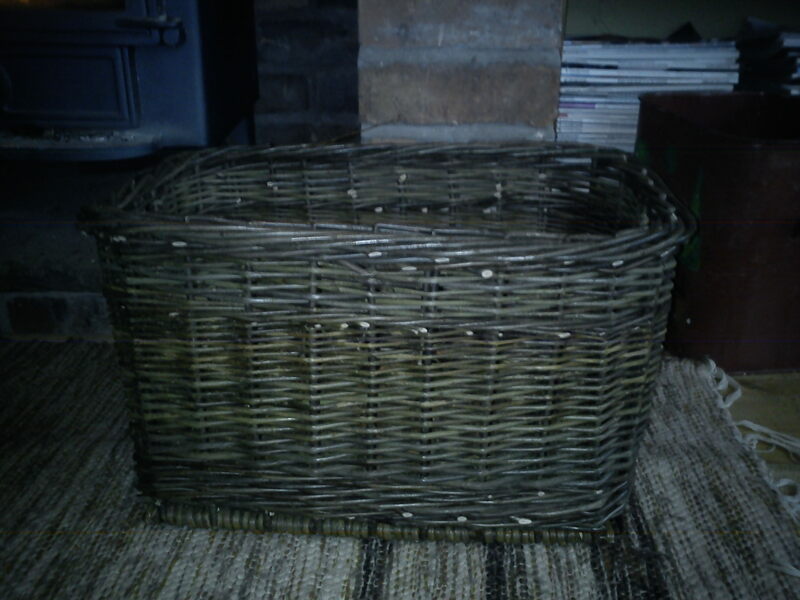 and managed to make a small gathering basket out of some left over fresh willow. It’s trickier than buff as it tends to go where it wants and not where it should, it’s a little wonky, but I think it’s cute! Looking forward to the meeting at Colwinston tomorrow and catching up with everyone. Just a reminder of our meeting on Monday 31st January from 7pm to 9 pm. I have been holding back on writing this blog certain that the envelope on the back of which I had written the draft programme for all of our meetings this year would turn up – it hasn’t! Thanks to Kathy we have remembered the first 2 months plans but one of the things we will need to do again on Monday is to decide the programme again! 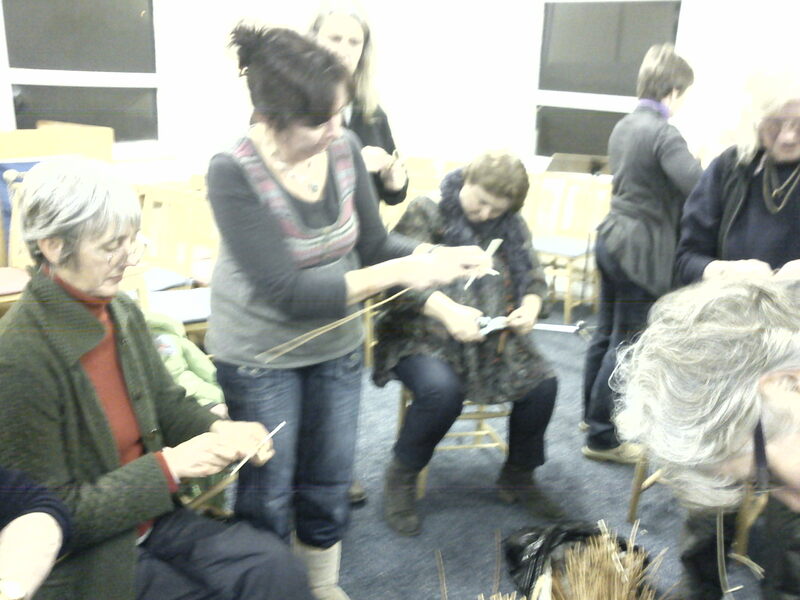 Anyway the meeting next Monday will be working on weaving hearts using fresh willow. Les will also be working with 2 people to make a start on Cyntell ribs and hoops. We can’t use the hall in Southerndown this month as the community council got in first and St Brides Village hall still has the yoga class so can you therefore let me know if you are coming and if there are more of us than can fit in my kitchen I will look for another venue and let you know by Saturday. 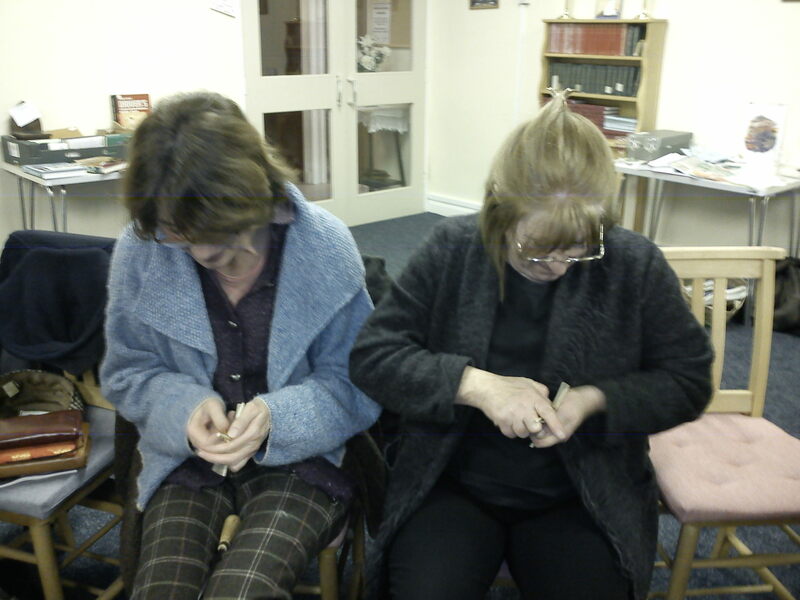 Thought you might like to see some photos of the last meeting – what a fantastic evening we had, wonderful food, wonderful company and some lovely weaving to finish off the night. Happy New Year everyone! 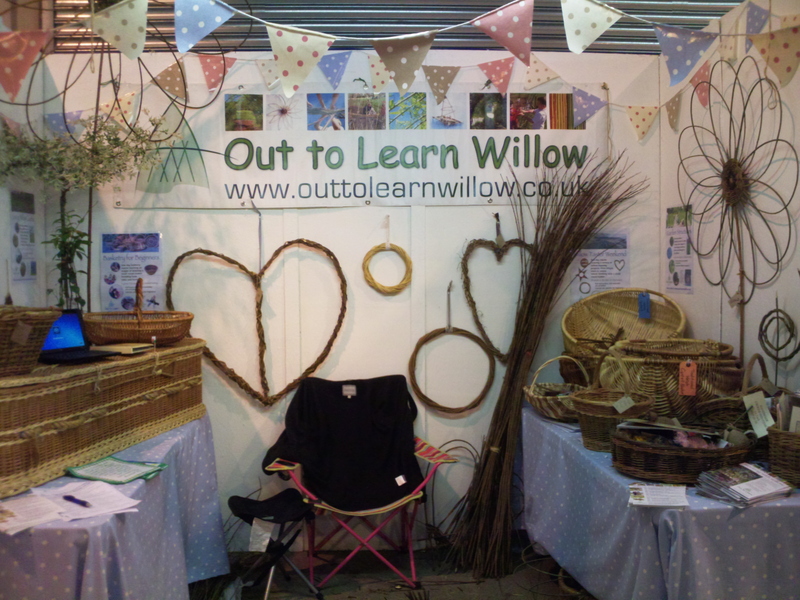 We are now on Twitter (Lovingthewillow) and just getting used to having a way of communicating with everyone on a daily basis (or minutely basis if we like!). Had a lovely couple of weeks with new basket courses running, harvesting vast quantities of willow in the pouring rain for some great jobs in the weeks ahead. 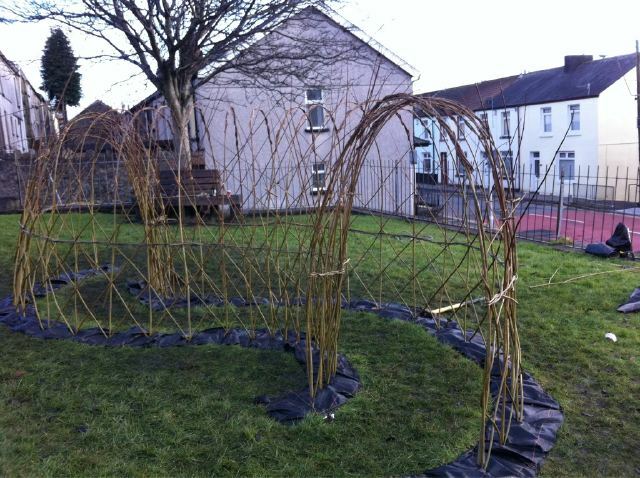 We have planted a basketry willow ‘fedge’ around the allotment at Wick Primary school. This will provide craft material for their Christmas projects next year, nothing like planning ahead! 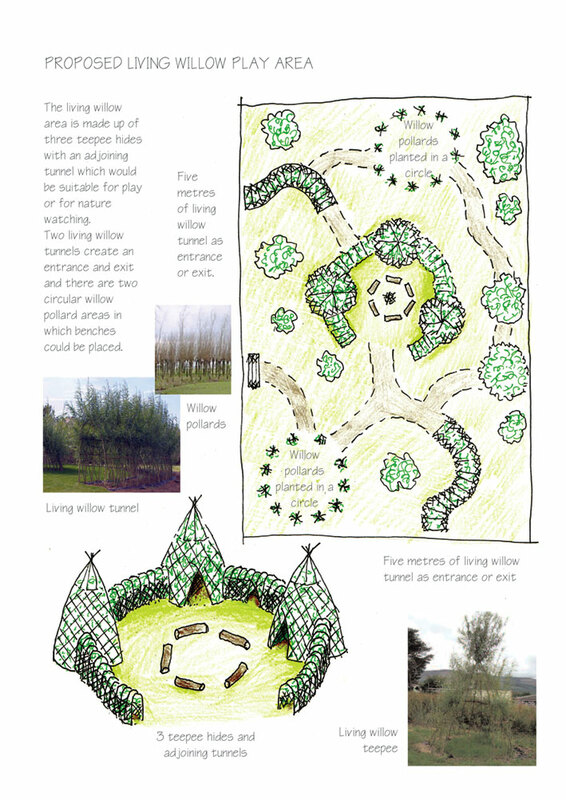 We have planted an ‘S’ shaped tunnel with the children of Cyfartha Junior school and completed some maintenance jobs at schools in Cardiff and St Donats Castle, maintenance of course is an essential part of working with living willow. The rest of the days have been spent organising the next few week’s work. A lovely Woodland Willow Playground in an urban school in Merthyr, basket courses at Crafts in the Bay in Cardiff, an African Village in Berkshire complete with woven mud hut in the centre, a communities first workshop in the valleys, willow wigwams and tunnels in Chepstow, training for Bridgend Youth Services, yet more harvesting, more maintenance and 11 more intrepid beginner basketmakers for our course on 22nd January at the Model House in Llantrisant. That course is (1 more than) full but why not join us on 26th January at All Saint Church to see what it is all about! What a great start to the Year – thought January would be a peaceful month for getting on with some basketry commissions of our own – ha, ha! A series of six basket making courses running every two months throughout the year designed to build your skills in basketmaking. Courses are suitable for complete beginners and can be booked individually. 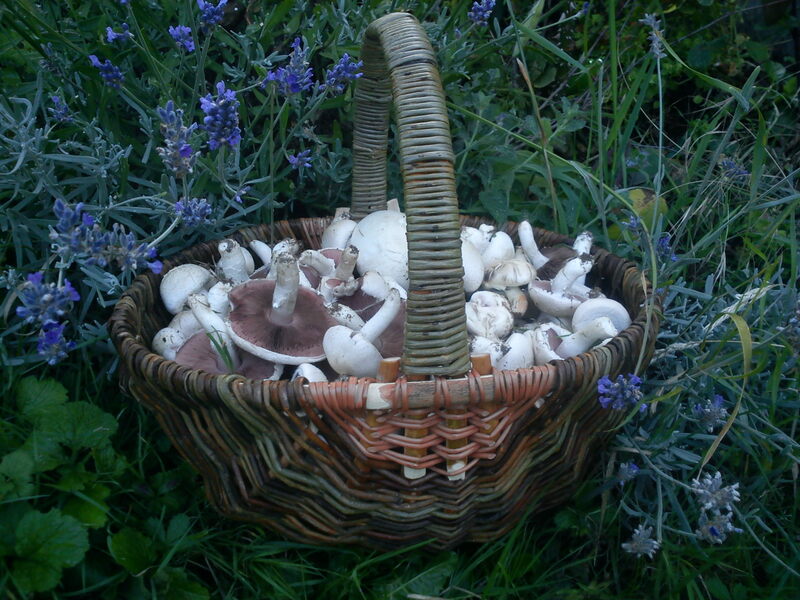 You will take home a completed basket at the end of each course. 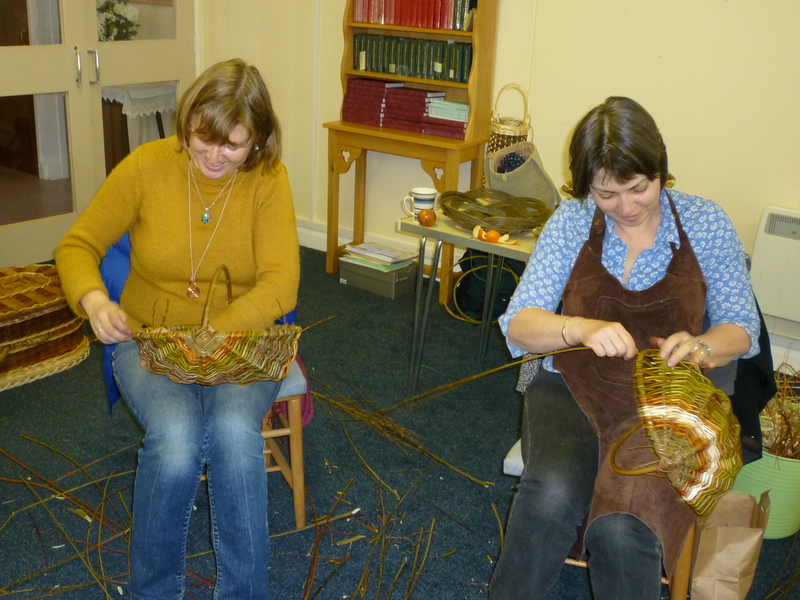 Learn to weave a small round base using a pairing weave, then how to stake up a willow basket and learn a 3 rod wale weave. Learn how to weave an oval basket on a frame and how to make frames and ribs for a completely individual kitchen basket. 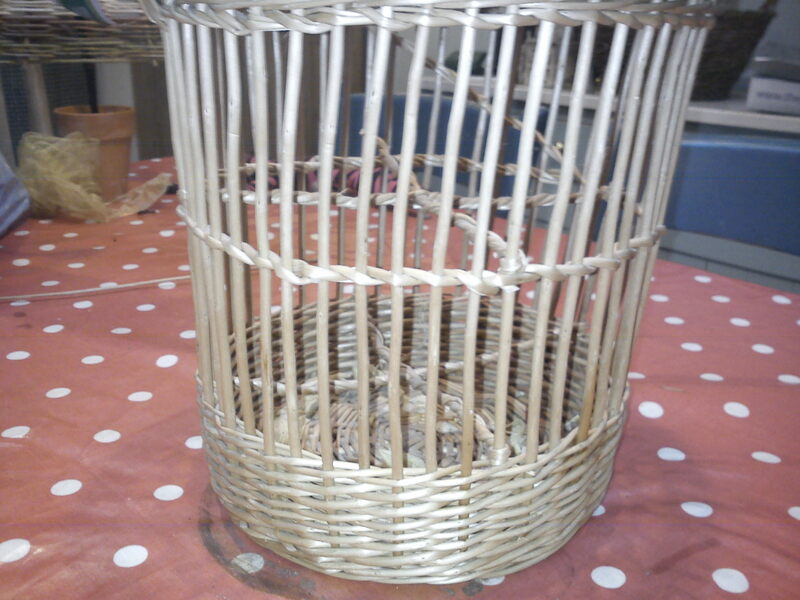 Frame baskets revisited, weaving a larger basket with handle to make a lovely garden trug. 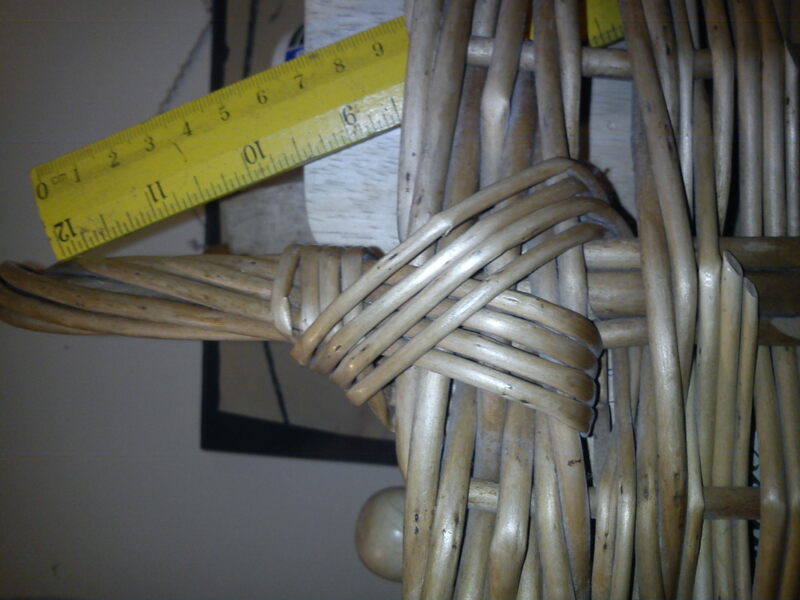 Round bases revisited, controlling the shape of your basket while weaving. 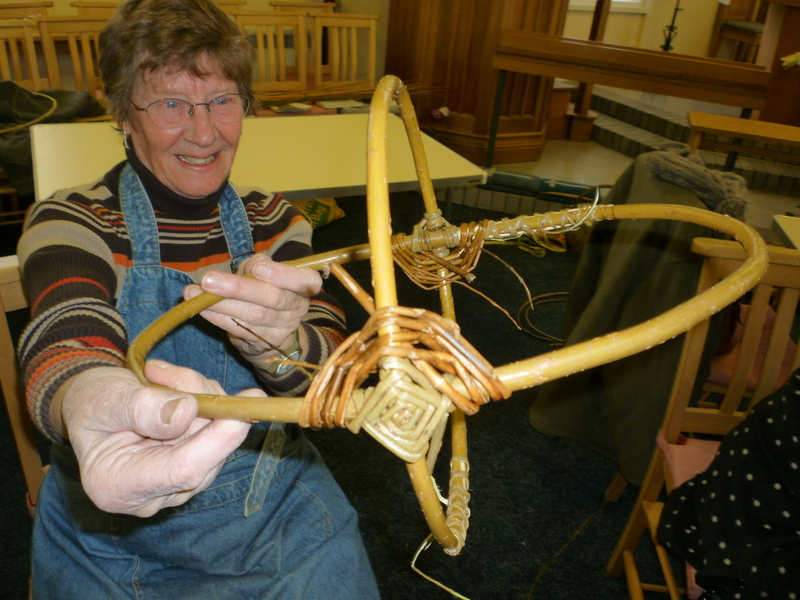 Learn how to weave an oval base to make a small oval egg basket. All courses are one day courses, 9.30am-4.30pm and cost £50 per course. Courses will be held at All Saints Church, Southerndown, Vale of Glamorgan. 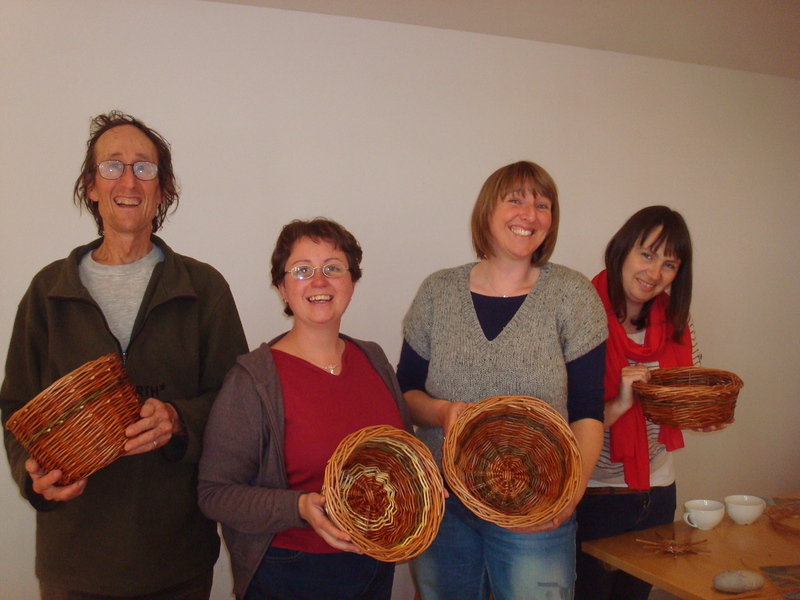 A series of six progressive basket making courses running every two months throughout the year. 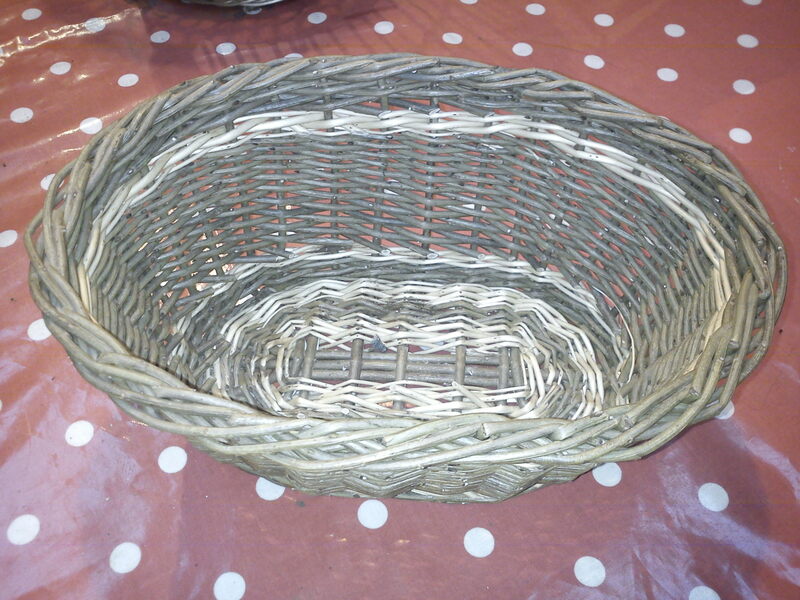 Courses are suitable for those who have some experience in basket making and want to further their skills. Learn how to make hoops with interlocking handles for frame baskets and weave a small collecting basket. 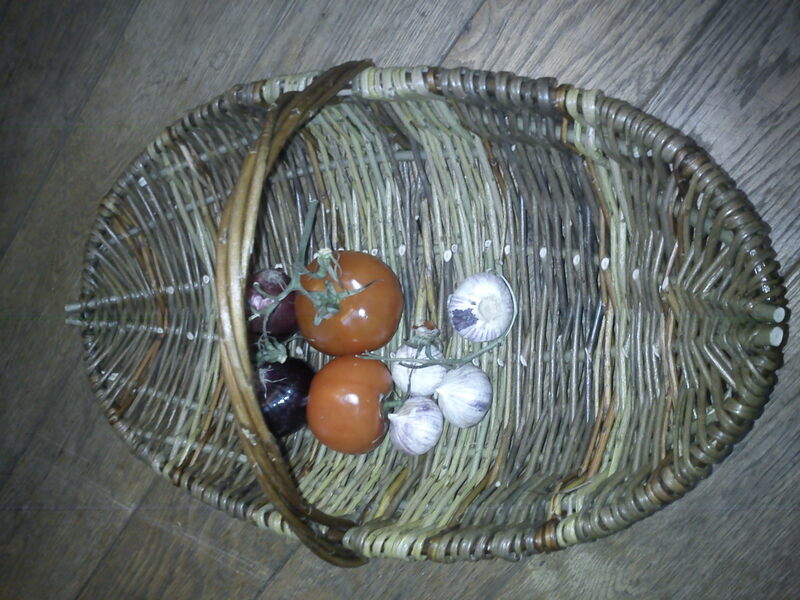 Oval bases revisited, weave a larger oval basket with handle liners. Try one or two more baskets as homework and bring to the next course to learn how to insert and wrap handles into baskets. 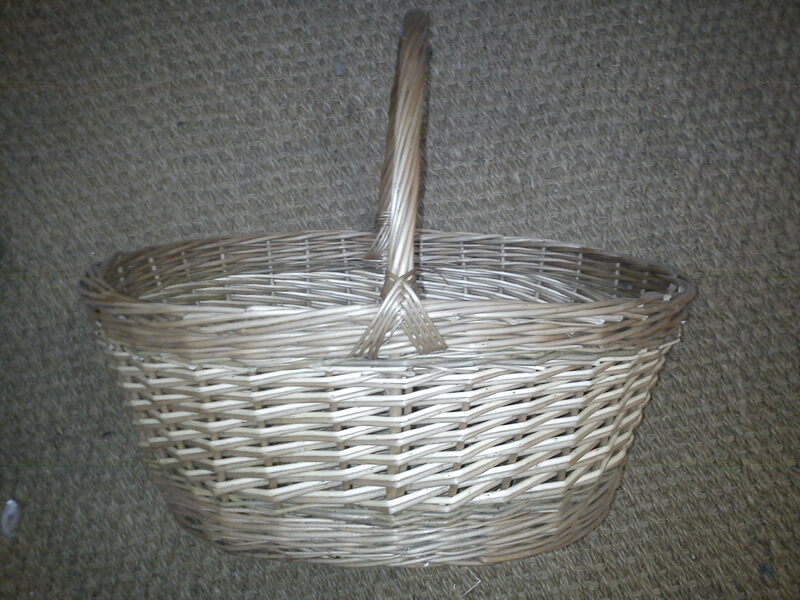 Learn how to make a traditional welsh frame basket using formas from basketmaker D J Davies. with a double handle. Day 2 weaving the body of the basket. Focus on practising control of weaves. All courses are one day courses except for square baskets which is a two day course, 9.30am-4.30pm and cost £50 per course, squares, £100. Courses can be booked independently, deposits required 28 days prior to course date. We really look forward to seeing you all again on some of these courses! 2010 – What a year! What a fantastic year we had in 2010! Here is what we got up to! Started with snow on the ground and lots of shifting round of our school work. 3 lovely living willow days in Abergavenny staying at beautiful Middle Ninfa farm in yet more snow, admiring the colours in Richard’s beautiful willow beds in stark contrast to the white all around. 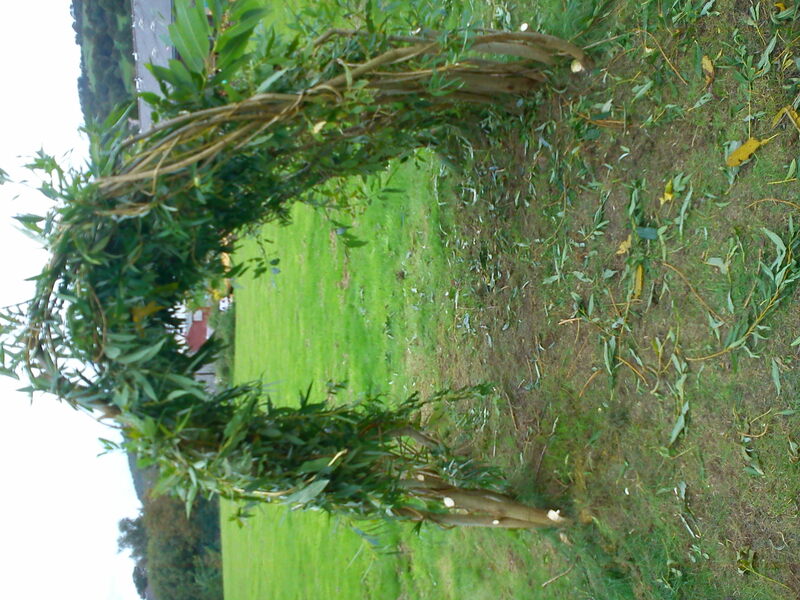 More living willow work at Caerleon, Penarth, St Donats Castle, Rhiwgarn, Maesteg, Alltwen, Trallwng. Great fun ‘What to do with your Willow Course’ in the rain with teachers at Crynallt Infants covering Willow structure maintenance and crafts for the classroom. 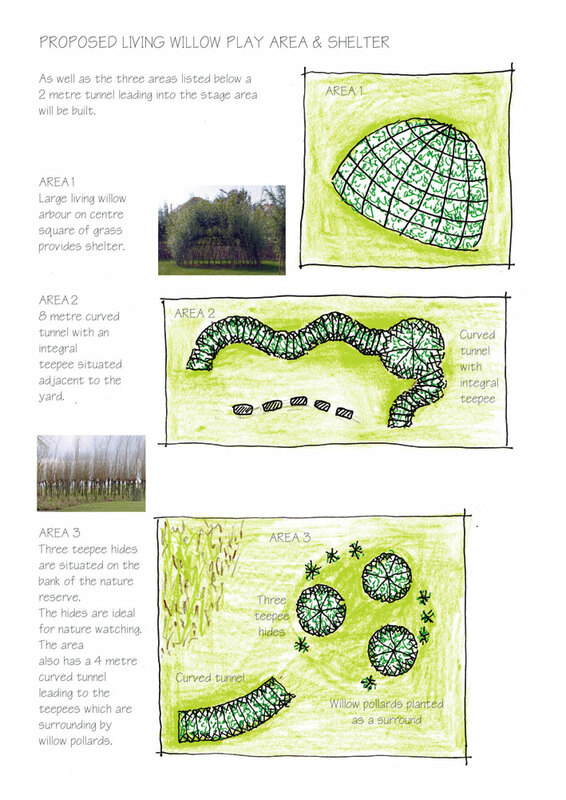 Exciting meetings with Jane Richmond at the National Botanic Gardens of Wales and Gaynor Witchard to see her plans for RHS Show Garden involving beautiful woven willow raised beds. 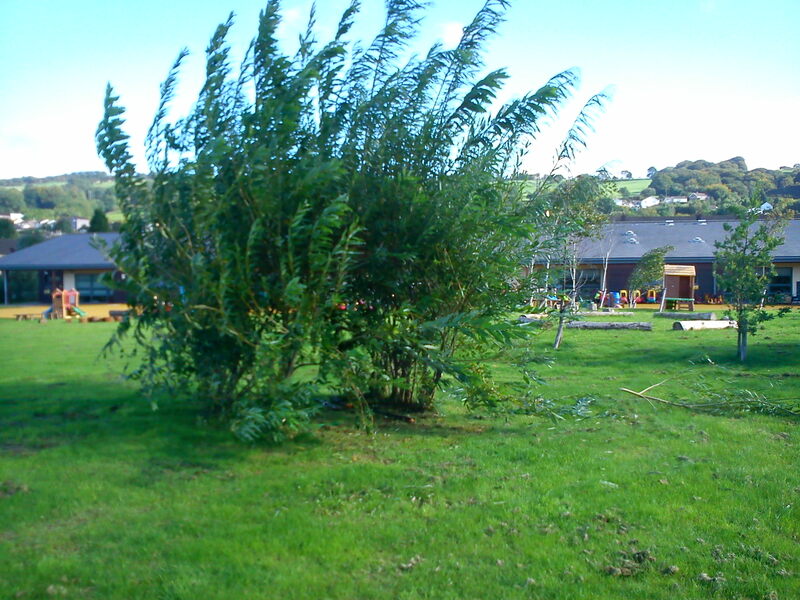 Living willow, living willow, living willow ………….. – Blaengarw Community garden, Eco Dysgu, Abercynon Church in Wales school, Melyn Infants school, Brynna School, Rhydfelen Nursery, Glantaf Infants, Townhill Primary, Wick Church in Wales school, Abercerdin Primary, Coychurch Primary, how on earth did we fit half term in? First teacher’s course at the Botanic Gardens involved working with lovely volunteers and teachers to maintain some of the living willow playground and construct an arch, dome and arbour. 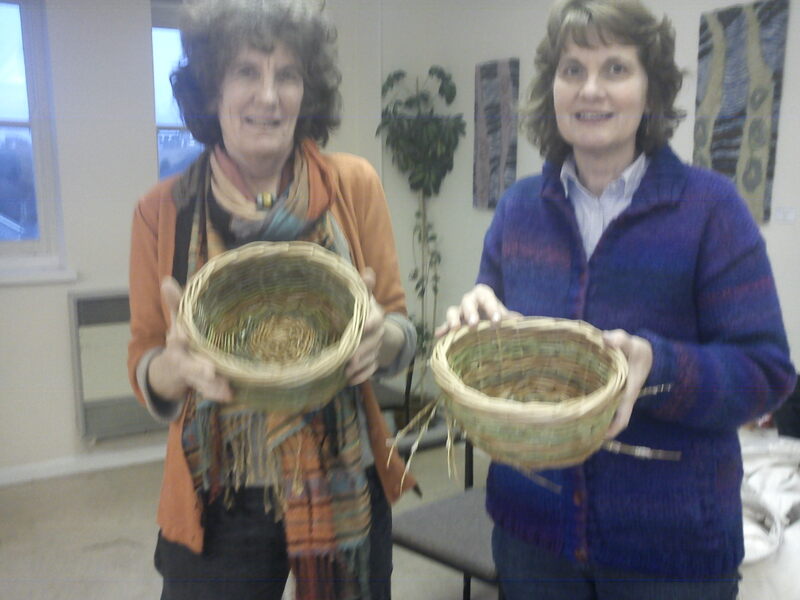 Beginners basketry course at the Heritage Coast full of enthusiastic new basketmakers who finished the day looking at their baskets as if they were new born babies! 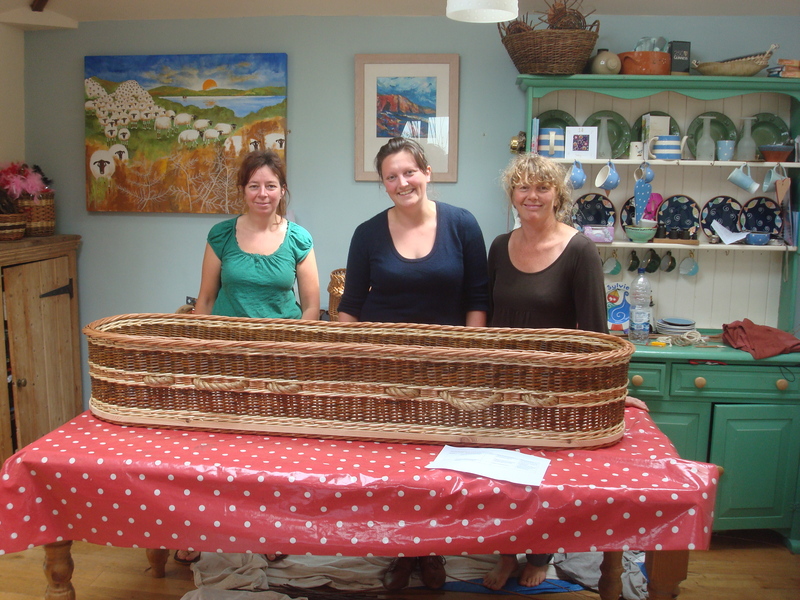 Basket group begin Cyntells in the kitchen – a new generation of traditional welsh basketmaker is born! Fantastic trip to coppice overgrown willow beds at National Botanic Gardens. Rebecca from Creative Rural Communities helps us to put together a grant application for our new venture – Residential Willow Weaving courses – what had we let ourselves in for! Gardening with Children All Year Round course full, full and yet full again – teachers love the willow sessions and so much can be done with it in the school garden: woven raised beds, play structures, habitats, craft …….. There is no more sustainable material which can be used in school. Willow bed kits fly out to schools, see www.outtolearnwillow.co.uk/willowcuttings.html ………. More living willow, Our Lady’s in Mountain Ash, Merthyr Children’s centre, Pengelli, Trehopkin, Cwmgors community garden, Litchard infants, Maes y Bryn, Y bont Faen, Crynallt Juniors, Llangiwg Primary. Mary Zamitt teaches 2 day advanced square basket course for us – 8 beautiful square baskets made, great teaching and lots of fun despite learning so much over the course of 48 hours. 3 Foundation Phase conferences – willow wands and crowns are the perfect role play prop for little children. Phew ………….. the living willow season ends. RHS SHOW CARDIFF! A day to construct petal shaped raised beds for ‘Irene’s Garden’, see http://www.witchardgardens.com/gallery.php. Then 3 long, tiring but fantastic days running a workshop at the show. This year we had 8 people with us and it still wasn’t enough to stop the long queues forming with adults and children dying to have a go at willow weaving. Basket group members did a wonderful job of demonstrating their skills. More shows and workshops – Margam park, Llancaiach Fawr, Bridgend County Guide Camp, Bridgend ESDGC Conference, Pencoed Growers, Learning through Landscapes, Wildlife Trusts, Groundwork, Valleys Kids ………….thanks to all our wonderful partnership organizations. Garden structures course for teachers fully booked 4 times over – what incredible enthusiasm from the schools and brilliant to think that a whole new generation of willow weavers is being produced in schools across South Wales! Flatholm island trip turned into an extreme basketmaking (not usually two words which fit into the same sentence) when the boat broke down and the intrepid weavers were transported by rib to the island. 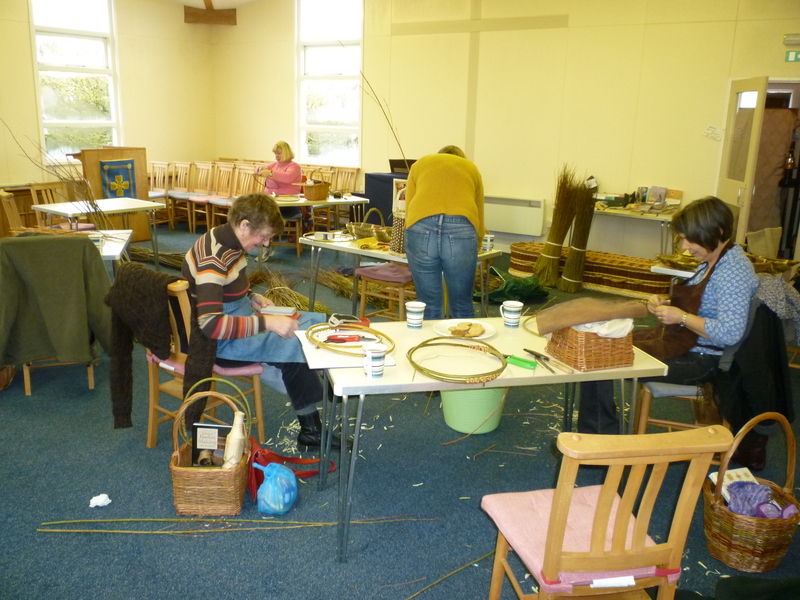 Vale of Glamorgan and Botanic Gardens Beginners Baskets – another 22 new basketmakers are introduced to the wonderful world of willow basketmaking. Supposed to be our quiet time of year – yet again one Giant Flowers and one Basketry for the Classroom course turned into four courses to accommodate the demand. Wick Guides prepare for Hampton Court flower show with a living willow ‘tent’ planted into 2 old tent bags. The ever patient Roy Youdale is consulted in preparation for our first residential coffin course. My kitchen is full of coffins – 2 adult, a dog and a cat – the family are bemused yet again. Great excitement to think that we may be offering this course next year. ROYAL WELSH SHOW – Our first time in the Glamorgan Hall craft section and a wonderful week. A coffin proves a great talking point and gets a wonderful new home with Jane in Barry. Great interest in courses and many new friends made since. 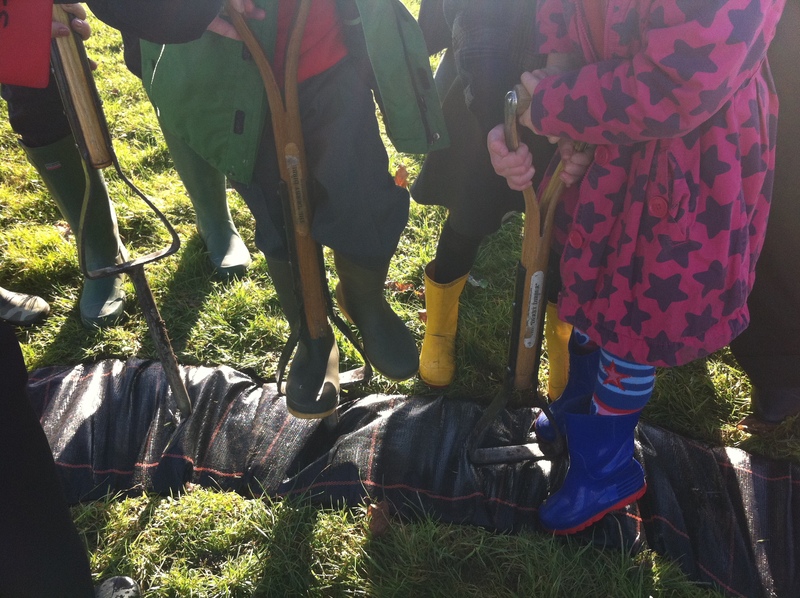 Out to Learn Willow Forest School runs 6 week pilot session at Wick Church in Wales Primary School – fantastic children, fantastic setting, hope to fit in more of this. Time for a rest and some time with our families but manage to fit in Margam Park, Vale of Glamorgan Show, Border Lace Makers and lots of basketmaking of our own, for ourselves and to fulfil our long overdue commissions – hooray! Residential courses here we come! An e-mail to Basketmakers across the country generated a list of 12 names of people who wanted to attend and weave their own coffins – the first 4 were booked onto the course and preparation begins. Hugely successful course run and now we know how the course will look for next year (September 19th – 5 day course). 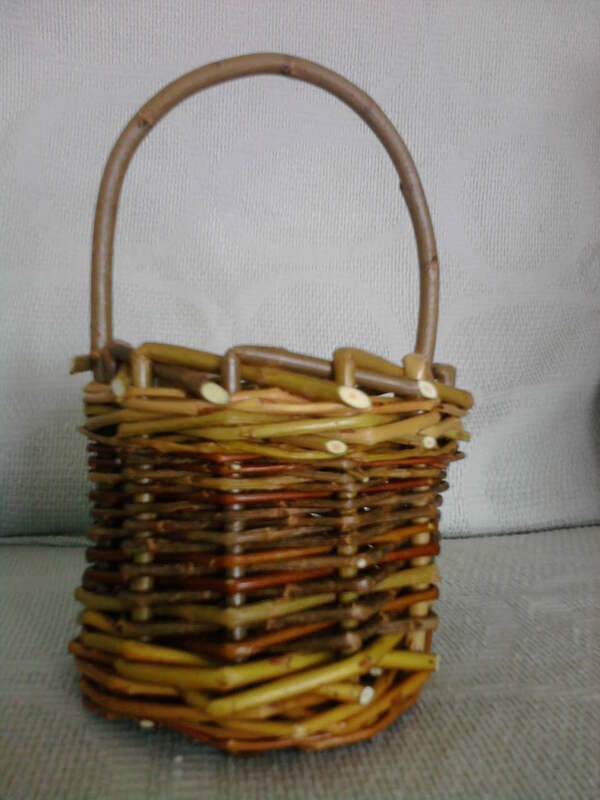 See November 3rd entry of http://welshbasketmakers.wordpress.com/ for full details. Can our Christmas Decoration courses really be fully booked already? 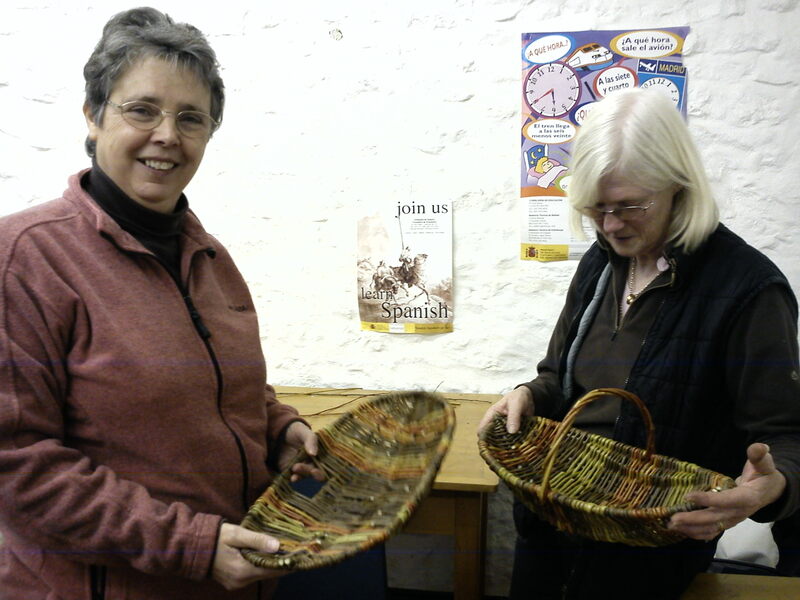 Vale of Glamorgan Progressive Basket course begins – one day a month for 6 months designed to provide a progression of skills for beginner basketmakers. 10 places and 18 applicants – ok let’s run another one starting in January! The basketgroup spend a long day on Flatholm Island weaving their Cyntells. More dates for Christmas decorations courses are decided and fill up immediately, we cancel all plans for our weekends from 8th November onwards. 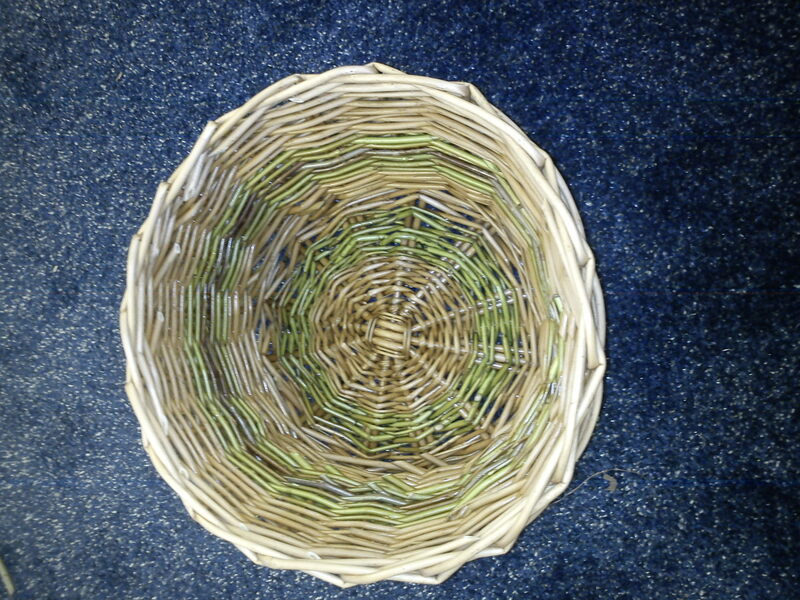 Progressive basketry course moves onto frame baskets. Welsh Basketmakers Gathering at St Fagans – 30 basketmakers meet up and faces are at last put to names. 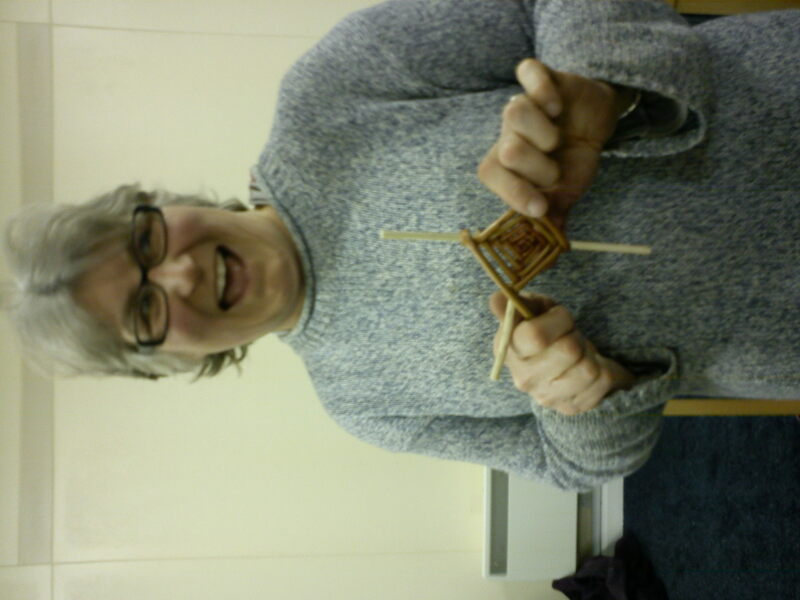 We start the month with our pilot Willow Weaving Taster Weekend course at the Heritage Coast Centre. Temperature -10 degrees outside and white with snow again (snow featured heavily in 2010) but the log fire was blazing inside and it didn’t stop our 12 course participants from weaving Christmas decorations, a frame basket, a plant support and a living willow arch within the completely snow-covered gardens. See http://www.the3rdi.co.uk/december10/chantal_december.html for a course participants view of her two days at Dunraven. ……… and of course maintenance of structures also begins, we absolutely love taming structures which have spent their summer happily growing into beautiful leafy shady places and turning them back into neat structural forms ready for another season’s growth next year. It is of course an essential annual task for any living willow structure, lucky we love it so much!. A white Christmas is here! 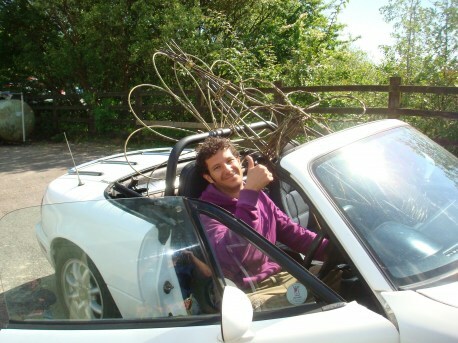 12 Willow decorations courses, 144 mince pies, 12 litres of mulled wine, 864 willow rings, trees ,angels ,stars ………. but 4 lovely living willow days postponed due to frozen solid ground and 6 inches of snow. Never mind – enjoyed the military operation of making Christmas decorations with 400 children at West Park Primary as much as the smaller numbers at Ysgol Ferch O’sger and Wick. Taking into account the 36 teachers who attended the school courses there were a lot of Willow christmas decorations across South Wales this year, how fantastic for the planet! Beautiful organic coloured willow supplied by local growers Pencoed Growers completed the wonderful festive season. Basket group enjoy a Christmas do with chat and delicious food, mulled wine (non-alcoholic for the drivers) and elderberry brandy (very alcoholic for the non drivers) for most of the meeting and a little bit of weaving rather than the usual other format of lots of weaving and a little cake! What a year! We offer a massive thanks to all our wonderful customers, friends and relations for supporting us so thoroughly during 2010. 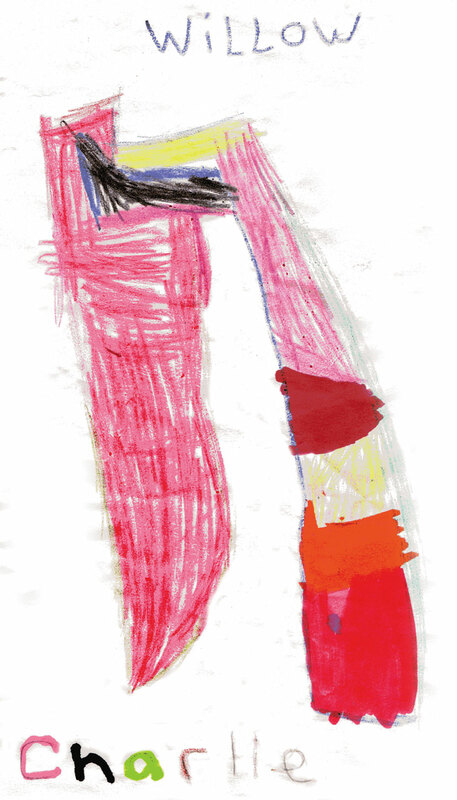 Watch this space for all news of 2011 – follow us here, on Facebook and Twitter!